Quirk Chrysler Dodge FIAT Jeep Ram of Bangor features the latest manufacturer offers and incentives on all new Chrysler, Dodge, Jeep, RAM, and FIAT vehicles. Discover which offers are best for you and drive off in a new car today. 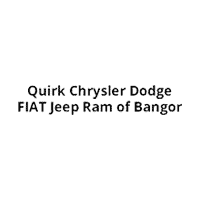 Quirk Chrysler Dodge FIAT Jeep Ram of Bangor is the Best Place to Go for Chrysler, Dodge, FIAT, Jeep and Ram Drivers throughout Bangor, Waterville, ME, Ellsworth, ME, Brewer, ME and Newport, ME. It’s no secret what makes our Chrysler, Dodge, FIAT, Jeep and Ram dealership special. We’ve always prided ourselves on delivering an unforgettable dealership experience from test driving to auto financing to caring for your car. Rest assured that you’ll always be treated like family as we’re committed to serving all of your automotive needs! It’s easy to jump to the conclusion that shopping for a new Chrysler Pacifica, Dodge Challenger, Jeep Compass, FIAT 124 Spider, Ram 1500 models can be strenuous, but it doesn’t have to be. At Quirk Chrysler Dodge FIAT Jeep Ram of Bangor, our friendly professionals are available to ensure that all your questions are answered while giving you the opportunity to peruse the Chrysler, Dodge, FIAT, Jeep or Ram at your liberty. When a vehicle’s caught your eye, simply catch our attention; we’re happy to schedule a test drive at your convenience. Have Your Heart Set on That One Chrysler, Dodge, FIAT, Jeep or Ram Model? Bring those dreams of a Chrysler Pacifica, Dodge Challenger, Jeep Compass, FIAT 124 Spider or Ram 1500 in your garage to a reality with the help of our flexible auto financing opportunities. At our dealership in Bangor, Maine, our team of experts is ready to dish all you need to know about our available car loan and lease options. Stop by today to find the car that’s right for you for a price that’s right too. In order to ensure your complete satisfaction (even long after you’ve driven home your new car) Quirk Chrysler Dodge FIAT Jeep Ram of Bangor staffs an onsite auto service and repair department that proudly serves drivers from Bangor, Waterville, Ellsworth, Brewer and Newport, ME. Thoroughly trained inside and out to know your Chrysler Pacifica, Dodge Challenger, Jeep Compass, FIAT 124 Spider or Ram 1500, our technicians are provided only certified Chrysler, Dodge, FIAT, Jeep, Ram parts when making repairs, ensuring your car runs as efficiently as the day you first took a seat behind the wheel.